The new PROXIA RSS Manager stands for “Really Simple Syndication in Production”, i.e. a really easy and active way to distribute information and status reports in production. This is thanks to the high-tech PROXIA MES system which allows you to subscribe to specific information as an RSS feed. This subscription helps to automatically inform the person responsible when certain status reports, e.g. with regard to an order on machines, are updated in the warehouse or by employees. The system is ideal for quickly informing the relevant people about specific changes, for example problems with an order or a machine. The purpose of an information system in production must be to convey information quickly and to the right people, and to take the appropriate measures. The benefit continues to lie in the fact that existing communication structures in the system can be enhanced. However, as any interested user can subscribe to the relevant feeds, completely new communication channels may be opened up and new synergies linked to these channels. PROXIA RSS Manager (Really Simple Syndication) is an add-on to a an MES notification system to create own RSS feed functionality based on production events. RSS notifications are sent automatically based on defined events. These “news feeds” can be subscribed to and displayed in all PROXIA Software AG in all MES applications. As “RSS” is an international information technology standard, there are many other applications available which process brief notifications. For example, current browsers such as MS Edge, Mozilla Firefox, or Google Chrome can be used in the same way as existing mail clients within the company to process these notifications. With support from MS Outlook, IBM Notes or Mozilla Thunderbird, departments in companies can also benefit from the information provided by the MES system, without the need to use additional software. The ideal application for foremen, production team leaders, plant managers or operations managers, PROXIA RSS Manager automates the supply of reliable information, e.g. about material defects, quality problems, maintenance deadlines and service cycles, machine breakdowns, OEE deviations, order/delivery delays or staff shortages. The recipient only receives the information relevant to him, in other words, feeds which are vital to the performance of his duties. RSS focuses on simplifying the monitoring of a wide range of resources and sources, e.g. machines, systems, process information or employees, which may have changed. The responsible people have to be informed of these changes in order to take prompt action. Whether a new machine, slow machine, or the infamous urgent order from top management – these examples show how functional and essential an RSS feed can be: A new production machine has been purchased, e.g. 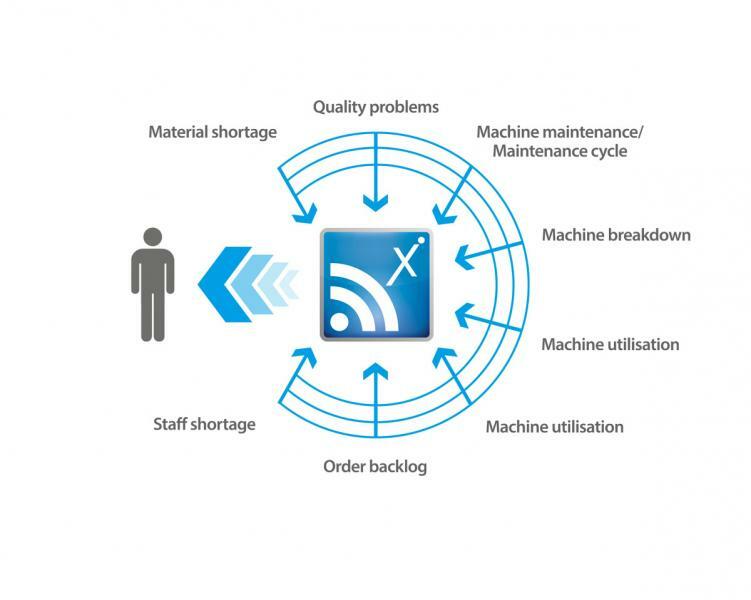 to replace one or more old systems, or is needed to develop a whole new product range, or a machine has been identified as a “slow machine” and/or has a very high hourly rate which is why it has attracted attention: All key people involved in the process should be informed quickly if there are changes to these machines which are deemed negative based on an existing definition. For example, if there is a machine fault, then the foreman, maintenance, production planner and production manager can be informed promptly and at the same time. This information is then sent out directly from the PROXIA MES software, and replaces the existing sequential information chain with various escalation levels (e.g. operator calls foreman, foreman calls maintenance, foreman lets the production planner know, and production planner forwards the information to the production manager). Actions can then be defined and taken quicker. Or: An priority order lands on the production planner’s desk direct from senior management, a “management order”. These orders mostly have very tight deadlines and have a high priority in production. To keep you informed of all changes linked to a specific order (faults) and predefined changes, PROXIA MES offers RSS Manager. If an RSS feed is linked to a specific order, all subscribers to the feed quickly receive the relevant information on the defined feed events. This enables the relevant offices and people to be informed directly if changes occur within the context of the order, and if actions are defined and implemented. PROXIA RSS Manager does the job of managing any number of “watchdogs” which constantly monitor the digital counterparts of their machines. As each user can condition his “watchdogs” differently, requirement-based notifications can be generated for each user. By sending information to users based on requirements, ever increasing data densities can also be managed better in future. Send your watchdogs as little helpers into your digital production processes to provide an extra pair of eyes and ears, because information often loses its value as it ages.